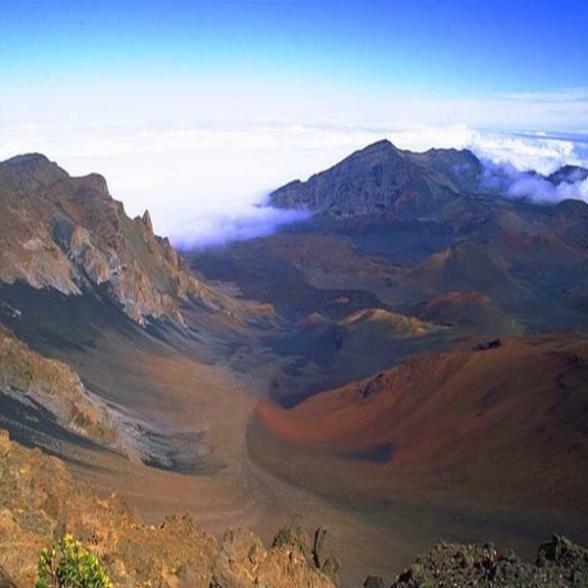 Haleakala National Park is truly a special place and on a trip to Maui it is an absolute MUST to visit. The Park is split into three regions, the coast with its lush greenery and fresh water pools, the wilderness area with its many ecosystems and endangered species and the incredible mountain summit. "I had the pleasure of experiencing Haleakala National Park in October 2008. My partner and I decided to leave our Kaanapali Hotel early in the morning and head for the summit of Mt Haleakala. Little did I know this was going to be one of the most memorable days of my life. The journey from Kaanapali took only just over an hour, we stopped half way up Mt Haleakala for a huge breakfast in a hotel with stunning views over the coast. The further up the mountain we drove the denser the clouds became, before long we were driving completely in the clouds, it was eerie but amazing. It didn't take long to reach the summit and view the impressive depression on top of this active shield volcano. All around us were shivering tourists in shorts and t-shirts, obviously they weren't aware that the temperatures up here vary between 40-50 degrees! The next hour was spent sipping hot coffee and watching the clouds slowly part, fade and give way to one of the most stunning views I have ever seen. Even now it makes the hairs on my arm stand up to think about it. You've got to experience this, hire a car and do it in your own time, please don't go with the coach crowds, it's not an experience you want to share with a bunch of chatting strangers!"